How quickly does Pebble compute? 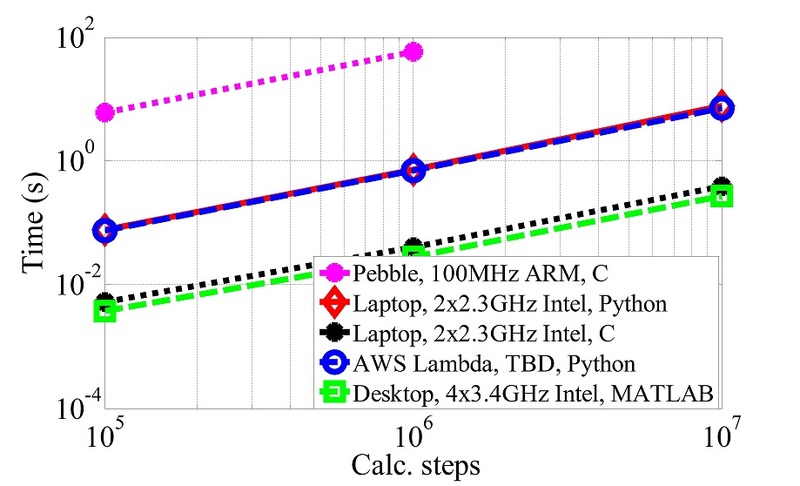 For example, the figure above shows the time a Pebble watch takes to calculate Pi to different precision levels (this calculation is often used to benchmark CPU performance), compared to other devices. The y-axis on this figure is logarithmic; the devices used and the language the Pi calculation code was written in are noted in the legend. I used both C and Python because not every language is supported on every platform: Pebble does not support Python, AWS Lambda does not support C. The speedup we get from having the compiled C code is evident from the comparison of C and Python code running on the same laptop; the speed-up is an order of magnitude, just as we would expect. My Pebble is perhaps the only Pebble in the world that can calculate Pi to astronomical Super Pi precision levels. I am sad to be discontinuing these experiments with is. Pebble is a fun toy to play with, but I can see how it was not a good product. While I loved playing with writing apps for the Pebble, when I needed a sports watch, I used my Garmin rather than the Pebble. This entry was posted in Consumer technology, Internet of Things, Research, Technology, Uncategorized, Wearable computing. Bookmark the permalink.